HostessChannel (HC) is an online platform for quick and aimed employment of Hosts on behalf of Exhibitors for their Events and Trade Fairs. To the Exhibitors HostessChannel provides contact details of Hostesses and event personnel selectable directly and tailored to the Exhibitor's needs. On the other side HostessChannel addresses not only Hostesses but more in general all professionals with experience in the Hosting and Exhibition business who are looking for a quick placement, offering them the service free of charge. This feature differentiates HC drastically from the role of common hostess agencies. In fact HC does not interfere in the selection process of the Hostess personnel and their economic settlement, which in the end translates into a cut of the extra costs for the Exhibitor up to 90% and over, see an example. 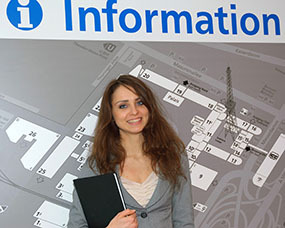 Among others, we connect promotion personnel for events in the following major cities: Berlin, Hamburg, Leipzig, Milan, Bologna, Hannover, Cologne, Frankfurt, Rome, Düsseldorf, Stuttgart, Munich, Dresden, Geneva, Paris, Riga, Vienna, Dortmund, Bremen, Nuremberg. As an Exhibitor with HostessChannel you can narrow the Hosts search down to their profile, review them and choose the ones that best suit your event. After the profile(s) selection you will be able to access direct contact details to initiate a private deal. All just within a few clicks and without constraints on payments. Our database can be updated in real-time so the search is restricted to the personnel effectively available on the chosen days for your event. Likewise Hosts are free to access their profile at any time for calendar update and to review their preferences. The functionalities of HostessChannel are mostly automated so everything is left to users' management, no need to involve other people in the middle, thus minimizing costs for the Exhibitor and bringing more convenient conditions for the Hostess at the same time. While membership and search is free for everyone, we charge low fees for Exhibitors who wish to have full access to the database. The paid credit is then deducted at every contact exchange based on a Pay-per-Action logic, that is only if both parties agree and after the exchange of contact details has taken place. Cut your agency costs, choose more and freely! Book at ease from your desk, available 24 hours a day, 7 days a week. See a practical workflow showing the booking process and find out how much you can save with HC. More details in the FAQ section. Create an account and start using our services in a few steps, registration and search functions are free!